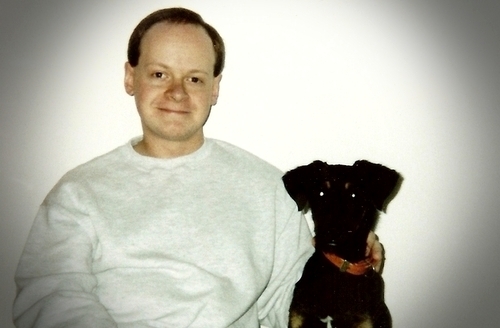 Both my wife and I grew up as the youngest of six children, raised by loving parents who nevertheless had grown weary of the trouble and expense of caring for family pets. There was a dog named Sam whom I barely remember, and Julie once had a hamster, but much of our childhood was spent without animal companionship. That might explain why we went through a small menagerie of creatures in our first few years together. It started with a white lab mouse (Buster) that I impulsively brought back to my dorm room after learning that any unclaimed rodents would be destroyed. Five more mice (Philco, Chiquita, Abilee, Melba and Krema), a rat (Frebis), and a pair of guinea pigs (Po and Gois) followed. We stuck to the easily manageable small animals that tend to not be prohibited by apartment leases. It was a new build, and thus its every molding, railing, and square inch of carpeting was in mint condition when we signed our mortgage. As a childless couple, we might have kept it that way for years. But just several weeks after we moved in, a co-worker started bending my ear about the dog for which her family was seeking a home. “He’s free,” she kept repeating, and my head began to fill with idyllic visions of leisurely strolls through our pristine suburban neighborhood with a faithful canine at my side. It seemed like the next logical step for us. With the careless optimism and naivete of youth, we decided to accept the offer. His name was Sparky, a moniker we instantly disliked. 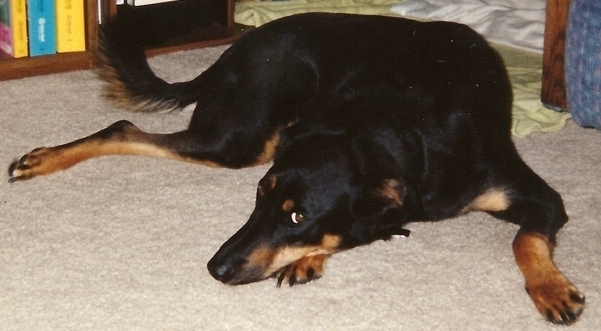 He was a skinny Doberman mix with floppy ears and an orange, studded collar. Still a puppy, Sparky was undeniably cute, but we were wary of his behavior. He jumped up at my co-worker’s children and tore at their shirts. It didn’t seem like he had been trained to obey any commands. However, he had been disciplined. “If he gits outta line,” drawled the husband, “jest take yer fist like this, stick out yer knuckle, and punch ‘im on the snout. He’ll understand.” Julie and I glanced at each other and considered the situation. This was no way to raise a dog. We could give the poor beast the care he needed, feed him properly, have him checked out by a veterinarian, and maybe take him to obedience school. We could change his name. We could get rid of that ridiculous, studded collar. Without fully understanding the consequences of our commitment, we coaxed the dog into our car and took him home. The trite name was the first thing we changed. There was a somewhat dopey, silly quality about our new dog, an endearing trait that was the opposite of dignity. Naturally, I searched for a name that would highlight this characteristic. I thought of the mythical Pegasus, a majestic winged horse, and it made me laugh to look at this scrawny specimen in such a context. Pegasus it was, then, which we quirkily abbreviated to Gus. And then we gave Gus a collar that made him look less like a junkyard dog. We had been told that Gus was housebroken, but we spread newspaper over the unfinished basement floor and kept him down there while we were at work as a precaution. In the first few weeks, he missed the newspaper numerous times, tore insulation from the roughed-in wall under the stairs, and chewed through the cord to a phone extension. We consoled ourselves with the fact that his shenanigans were limited to the basement, but he soon expanded his repertoire. One of his exploits became legendary. In later years, we would refer to it as “the milkshake incident.” That is because it began when we descended the stairs to discover what appeared to be a thick milkshake deposited prominently on our living room carpet. We would have been grateful if the brown blob had indeed been a milkshake, but instead it was the foul aftereffect of putting Gus on a different brand of dog food. It was such a desecration of our new home that Julie actually cried. As for Gus, he would never surpass this offense, with the possible exception of a wee-hours crisis in our bedroom that become known as The Gus-Log Archipelago. We devoted time, money, and energy into transforming Gus into the sort of dog we envisioned he should be. Some of our endeavors worked better than others. The portable kennel, for example, transformed Gus from a puppy who still wasn’t quite sure whether it wasn’t okay to sometimes go on the carpet into a dog who fully understood that pooping in the house was always wrong. Not that he didn’t occasionally do it anyway. On the other hand, Gus proved to be embarrassingly incompetent at his humane society obedience classes. The only trained skill he ever mastered was a “sit – still – down” combination which he would faithfully execute whenever a Milk-Bone was at stake. Techniques designed to stop his chronic barking were a total failure. When it came to the art of the heel, Gus was simply incapable of it. Taking him for a walk was an upper-body workout. He actually stretched the circular link at the end of his choke chain into an oval. Gus could not be trusted outdoors without some form of restraint. Until we built a privacy fence, we had to let him out into the back yard on a lead. For several seasons, we had a ring of dead grass caused by his frantic running whenever he detected another living creature within a hundred yards. A few times he actually tore up the sod and ate it. And whenever he got the chance, Gus would bolt out the front door and tear down the sidewalk, roaming free until we could find him and lure him into our car. Incorrigible as he was, Gus was our dog, and we regarded him affectionately. In fact, we practically doted on him the first couple years, as evidenced by the number of photographs we took of him during that time. Things changed, though, with the birth of our first daughter. Gus was immediately demoted to a position of lesser importance. In retrospect, he took it well. Probably he had no idea. Or maybe he appreciated the delicacy that is dirty diapers, which he lustily consumed on more than one occasion. When our second daughter was born, Gus was pushed even further from the center of our attention. Over the years, he matured into a somewhat mellower dog, relative to his tumultuous puppyhood. However, sheer excitement was never far away for Gus. One needed only to mention the name of one of the handful of other dogs he had come to know, and he would start to race about the house in a frenzy, searching for his friend. The word “David” had the same effect, due to my brother’s generous habit of bringing quantities of dog treats with him whenever he visited. Also magical was the phrase “post office.” In those days, when we actually had the need to regularly mail things via the U.S. Postal Service, we would take Gus along for the ride, which he enjoyed more than anyone might think was possible. Julie and I maintained a running debate over just how intelligent our dog was, and we most often concluded that the answer was “not very.” Sometime, though, he surprised us with the complexity of his thought processes. One winter afternoon, Julie was enjoying a good book and a cup of tea in the living room. She happened to observe the most curious yet subtle change in our dog’s expression as he meandered past the coffee table. He eyed the tea momentarily, almost as though he was taking note of it while trying to appear inconspicuous, then he coolly walked across the room and lay down. We left the house shortly afterward on some errand, and when we returned, Julie discovered that her mug no longer contained the ounce or two of tea that she had left in it. The cup itself was otherwise undisturbed. Years passed by, the girls grew older, and so did Gus. He started to slow down as he approached his twelfth year, taking longer to gingerly rise from a resting position. Eventually, his back end became a burden to him, and he sometimes yelped from the pain in his arthritic joints. Even the two steps from our kitchen into our back yard became difficult for him to navigate. When we had to carry him out and back, we knew that our pet adventure was nearing its inevitably sad ending. I got a flat tire on the way to work on the cold February Friday on which we had scheduled Gus to be euthanized. It was strange, anyway, all of us going off on our normal routine knowing what was coming at the end of the day. It was stranger still to grapple with changing a tire totally devoid of irritation, my mind occupied with a weighty concern that made a flat seem insignificant. He was alive, and soon he would be dead. It would be our fault that he would be dead, yet it would be for the best. I sighed as I thought of how much more difficult it would be for our daughters. My brother David, always loved by Gus, went to the vet with us. Gus was always thrilled to go to the vet, and so he was the least stressed of all of us. The whole procedure was over quickly, and we drove out to David’s rural home to bury Gus. While Julie and the girls stayed up at the house, David and I set up flashlights in a spot near the stream and got to work. It was cold and dismal, the rushing of the water interrupted by our labored breathing, which sent condensing fogs swirling up into the darkness. The soil was mercifully soft, and when at last we were done, we sat at opposite ends of the grave, our legs dangling over the sides, and took a measure of satisfaction in our grim work. Julie and the girls joined us for the solemn ceremony. We comforted each other with the thought of how beautiful a resting place it was was for Gus, just the sort of natural setting that he loved to explore. We shared our memories and regrets, and then we trudged back up to the house. No dog ever had a more dignified funeral. Nor had any goofy dog a more majestic name than the mighty Pegasus. A young man and his dog. 1 comment on "The Mighty Pegasus"
Your post struck a nerve with me and of course , images of my K9 pal came rushing back. The last scene was especially sad and yes, it did sneak up on my tear ducts.